Welcome to our Inking Pink Awareness Hop! 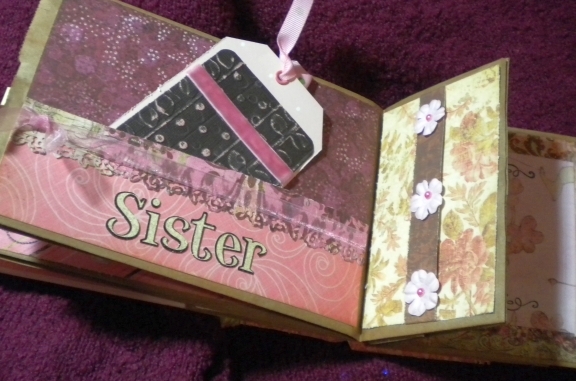 Our paper crafting community spans the globe and brings all of us together under a common roof. We are grandmothers, granddaughters, mothers, daughters, aunts, sisters, best friends, wives, cyber-friends and design team teammates. Many of us have family or friends touched by breast cancer and all of us want to encourage all of you to check yourself! This hop will take you around the world, so please sit back with your morning coffee or evening tea and celebrate our stories and projects with us. Some of your fellow crafters along the hop are even offering blog candy! Please give a little comment love to each and every crafter along the way. We hope you enjoy our hop, and most of all we all want YOU to give yourself the greatest gift and do a self-check tomorrow. The more you do it, the more breast aware you will be! Our hop starts at Patricia's blog so if you started some where else please start there you don't want to miss what we have for you. The fun slider card! Tutorial coming soon! The mini book made with 1 sheet of 12x12 paper. I think there is another tutorial in the works! 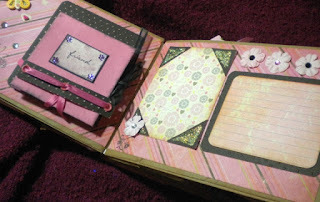 Lots of pockets all through this paperbag album for tags and photos. Now it's time to check out the next blog along the hop!! Stephanne has something great in store for you! And in case you need some direction...here is a list of all the wonderful blogs included in this hop! what a nice album! so pretty too! Love your paper bag album! Shelley I love the albums awesome job. Im sure your sisters will love them. Thanks so much for being a part of this hop. Wow awesome album!!! Just beautiful!!! I am a follower. Awesome prize. Thanks for the chance to win. I love your album!!! just gorgeous!!! 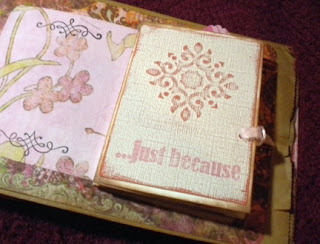 I am loving this blog hop.. You girls are inspirational!! WOW! Stunning album. I am looking forward to seeing it all finished. What a beautiful album. I'm a follower. 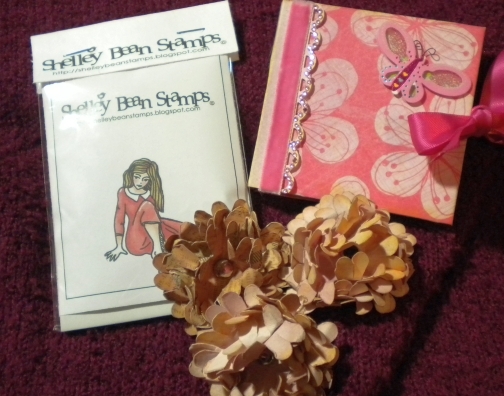 Thank you for sharing and being a part of a great blog hop. This is just stunningly amazing!!! I cannot WAIT to see your tutorials and videos to follow!!! Wow this is beautiful. I love those flowers!! Oh this so gorgeous, gorgeous, gorgeous! Thanks so much for your support & encouraging breast cancer awareness & prevention. My sister is a survivor – 15 yrs & still going strong! I have a mammo every year on my birthday (of all days) 10/15! All is well! 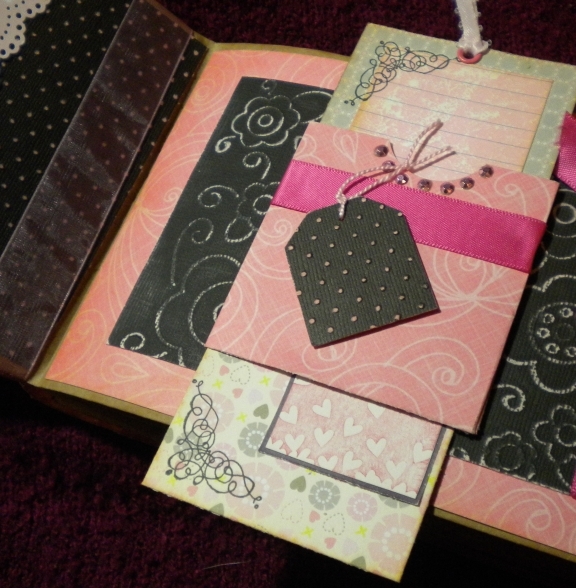 Hi Shelly, your album is simply amazing with all the beautiful papers and embellishments. So wonderful to be in this Hop with you. Your album is terrific! There is such a huge amount of work going into it! What an outstanding album! I am impressed! LOVE IT! Oh my gosh - what a stunning project!! So happy to be participating in this blog hop alongside you! That is the cutest creation ever, Shelley! I'm already a follower.. thanks for a chance to win! Beautiful album! Thank you for sharing! Love what all of you ladies are doing and your doing it with a cause, thanks so much for letting me take this trip around the world with all of you! too cute - what a great job! Love your mini album! The colors, textures, etc are just amazing. Thanks so much for sharing! Awesome album. Can't wait to see the tutorials. Thanks so much. The album is absolutely adorable!! Thank you so much for supporting the awareness to get your tata's checked!! Hi Shelley, the album is gorgeous!! I am now a follower too. Hey Shelley, I really like your album and do you know that I have not used the flowers you gave me just because, than I won't have them!! I want to see your tutorial! Such a great experience to be apart of this Hop! Your album is going to be gorgeous! I can't wait to see the finished product! I'm glad to be a part of this hop with you! Hopefully we will help spread awareness to save the Ta ta's! My total favorite out of that album is the slider card insert! I NEVER thought to use one in an album but will definitely do on my next one! TFS! Beautiful album! You did a great job on this - TFS!! WOW!!!! 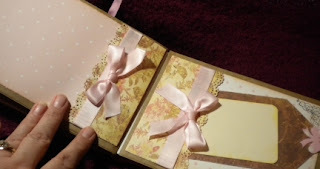 I have recently been into making mini albums but this.. this is amazing! Its beautiful and im sure it took TONS of time.. but thank you so much for sharing it looks fab! I cant wait for you to post a video of it.. i will definitely be watching that! I am also now a follower of yours. thanks for sharing, the chance to win, and for being part of this great hop! pretty album...it's a nice idea TFS! Love this ....it's amazing!! I'm already a follower on your blog. Love your work. Thanks so much for taking your time to do this blog. It means a lot. My Mom is a survivor!! 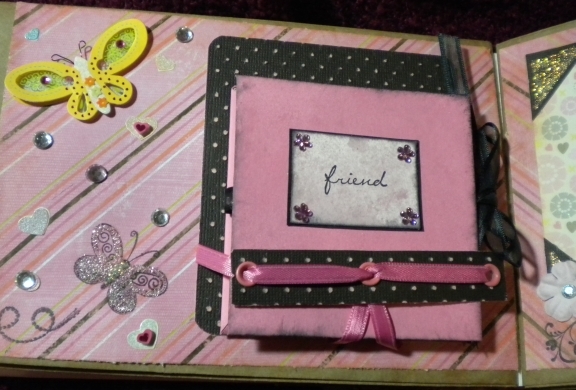 Thanks for sharing your adorable album/page ideas! What a great job! Thank you for being a part of this great hop! I would love to win your treats! I never realized you designed your own stamps! Very impressive! Absolutly lovely!!! What a great gift this is. Love all the pockets and extra's you put into it. Thank you so much for sharing your talent. Beuatiful beautiful album!! Love it!! I do know how much work goes into them! 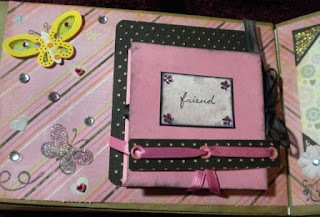 I made 12 paper bag albums for a 10 year olds party and thoes took alot of work. So i can just imagine what your takes!! Cant wait to see the finished product! Thanks! That project is absolutely stunning! I have never tired anything like that but I think I may try! Great cause! wow nice project. thanks for taking part in this hop. Oh Shelly, your album is truly just so beautiful, so full of details and the flowers are lovely also. Looking forward to seeing a video. Take care and have a wonderful week. What a fabulous project! Thank you for sharing. Awesome album!! Love the colors!! ummm the Google friend connect is not workin right this moment...I'll be back to try later. Man I would love to win that giveaway. You project is beautiful. OH MY GOSH!!!!! I love the Project and the flowers are Awesome!!! TFS! Wonderful creations ! Wow how creative!! Looks fabulous! Thanks for the chance to win some great candy. I AM FOLLOWER #500!!!!! WOO HOO!! When I win (I have been saying this on all the blogs, because apparently I am gonna win everything -lol) I can be reached at fancyfree4ever@yahoo.ca. Thanks for promoting this cause! This is stunning, so many beautiful details and fabulously put together!! I am honoured to be taking part in this event with such talented women just like you!! Terrific blog and great project. Thanks for sharing. Beautiful work!! I am so glad I did this hop, I have found so many great blogs, like yours!! Beautiful album. Thanks for being part of the pink hop! Thanks for the look at that cute album! Great idea! Thanks for being a part of this hop. 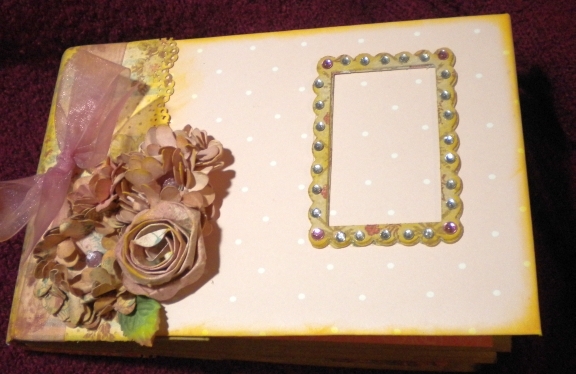 Thanks for sharing that cute album...what a cute craft! I have loved all of the blogs in this hop. thanks for being a part of this wonderful cause! Awesome book. I am excited to see that tutorial. Thank you for being part of an incredible blog hop. Very eleglant album....I'm sure it will turn out beautifully! Thanks for the wonderful hop for such a great cause. I am a new follower....enjoyed your projects and talent. Your album is beautiful! I am sure your very lucky sisters will appreciate it as well! This is very pretty! I love all the details and time you put into this. I am already a follower and love your blog. Very nice pages...so much work done and to do. Thank You for being in the hop and for a chance to win cool prizes. What a beautiful album!! You did a wonderful job!! SAVE SECOND BASE, GET A MAMMOGRAM!! 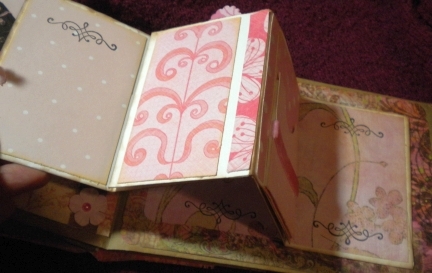 OMG, your album is beautiful with so many details. Awesome project, Shelley. Thank you for sharing and I can't wait to see your video on this album. Beautiful album! I am both proud and honored to have shared in such a wonderful blog hop with you in hopes to spread breast cancer awareness! I love your ideas! 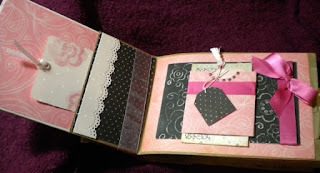 Thanks for sharing and joining in the blog hop! Awesome album and A Great cause, breast cancer awareness. Thanks for the chance to win the fantastic giveaway, and letting me be part of it all. I can't even tell you how MUCH I want to win your incredible paper bag album!!!!!!!!!!!!!! :) Maybe then (just maybe) I'd be able to duplicate it/make one of my own! It is so amazingly beautiful and there are so many new techniques for me to try! I'll have to keep checking back, because I would love to see your tutorials. What an amazing album! Can't wait for all of the tutorials on how you made things! Thanks for sharing! your album is just gorgeous!!!! I love your album and would love to try to make on like it, thanks for sharing. I am a new follower. Thanks for giving me the chance to win! Love the album. thanks for sharing and the opportunity. Love your album! What an awesome project! Beautiful album. Thanks for sharing.